Barbecue ribs at this famous spot richly deserve their international reputation. : Owned and operated by the family of Charlie Vergos since the 1940s, this unique joint is best known for its pork ribs, both wet (with sauce) or dry (rubbed with dry spices). Charcoal-broiled lamb riblets, barbecue chopped chicken, and vegetarian red beans and rice are always good choices as well. We also like the slaw. Only beer and wine are served, and if you're a wine purist bring your own bottle (corkage fee is $9 but not allowed if coming with a large party). Being true ambassadors of Memphis products, the place offers Memphis-made Ghost River beer. There are no desserts; however, you'll be so stuffed with barbecue by the end of the meal you won’t even care. 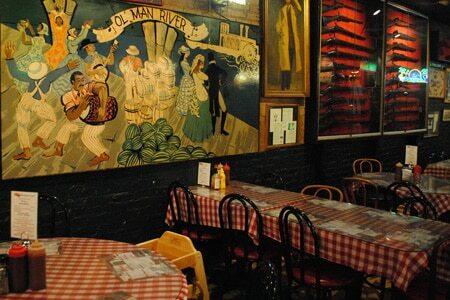 In classic Memphis 'cue joint style, tables are covered with red-checked vinyl. Walls boast a mini-Memphis history museum with antiques and classic photos. The entrance is off a downtown alley and a parking lot is not available; valet service is a possibility. The restaurant's special seasoning and sauces can be purchased online.